A movie on what happened in the mountain ranges north of Rio de Janeiro. Please, note that most valleys are / were living places. Una película sobre lo que ocurrió en las sierras al norte de Río de Janeiro. Por favor, tenga en cuenta que la mayoría de los valles están / estaban viviendo la gente. How are your compasses behaving. With a south pole so close and do you feel any connection. I am sorry the tragedy ongoing seems to escape our media. Well there doesn't seem to be enough coverage. I often find stories covered on CNN..
That Google Geo Eye is a great way to show the area. All that rain comes off the mountains and is funneled into the valley area. We are not close to the south pole, on the contrary, we are closer to the Equator at 23 degrees south. You may have had the impression of that proximity because of apparent snow covering some of the mountains, but those were cloud coverings due to the effect of clouds in the original imagery not being taken off the scenery. 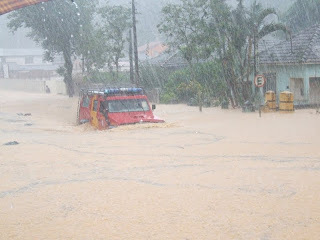 I believe the authors did not bother to do that because those particular areas were not affected by the flooding. We do have below freezing temperatures during winter in the highest parts of this mountain range, but not snow. We have snow in the southern highlands (closer to Argentina and Uruguay) and even so, during one to two weeks at most a year. Magnetically speaking our compasses are operating normally so far. Our airports did not have to change their runaway heading numbers.... yet. At least 10 people have been killed and over 21,000 evacuated in floods in the south of Brazil, civil defense officials reported. 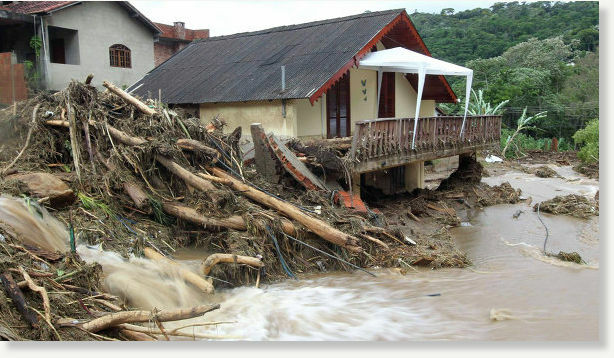 Torrential rain caused floods and landslides and destroyed roads in the states of Rio Grande do Sul, Santa Catarina and Parana. Two people are missing. Overall, up to 60,000 residents of the South American country's south have been affected. OMG, that is so awful....... So much going on everywhere.